Get Fit, Stay Well! gives students the targeted, personalized guidance they need to get started, keep motivated, and approach the next level in their own fitness & wellness. 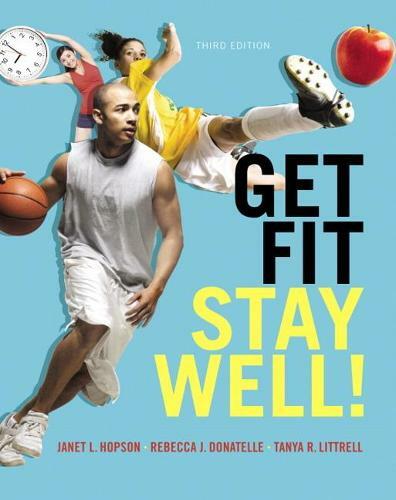 The Third Edition provides dynamic media, content that activates learning, and personalized approaches to fitness and wellness that students can apply for life. Maintaining the highly praised hallmarks of previous editions-integrated case studies, three-pronged labs, a fresh graphical approach, and extensive strength training and flexibility photos and videos-this edition further engages students by including vibrant GetFitGraphic infographics to inspire thinking and discussion. QR codes in the book allow students to easily access exercise videos and fitness programs right on their smartphones. Instructors can track and assess student progress with the easy-to-use MasteringHealth. Included with Get Fit, Stay Well!, MasteringHealth is an online homework, tutorial, and assessment product designed to improve results by helping students quickly master concepts. Students benefit from self-paced tutorials that feature immediate wrong-answer feedback and hints that emulate the office-hour experience to help keep students on track and prepared for lecture. Personalize Learning with MasteringHealth: MasteringHealth coaches students through the toughest fitness and wellness topics. Engaging tools help students visualize, practice, and understand crucial content, from the basics of fitness to the fundamentals of behavior change.Engage Students with Dynamic Tools: Online resources and a mobile website for personal fitness and wellness programs guide students through every chapter and encourage healthy changes.Activate Learning with Real-world Fitness & Wellness Topics: A modern presentation of strength training as well as two new wellness programs brings fitness and wellness to life for students.Encourage Behavior Change: Labs, case studies, and new tips for making healthy changes help students learn what they need to do to become fit and well for life.Keep Students Motivated: New GetFitGraphics and reflection questions in the labs keep students on track. Note: You are purchasing a standalone product; Mastering does not come packaged with this content. If you would like to purchase both the physical text and Mastering search for ISBN-10: 0321911849 /ISBN-13: 9780321911841. That package includes ISBN-10: 0321933958/ISBN-13: 9780321933959 and ISBN-10: 0321957393/ISBN-13: 9780321957399. Mastering is not a self-paced technology and should only be purchased when required by an instructor.